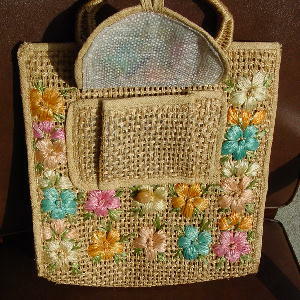 This vintage loosely woven twine straw purse has double oval handles. The tag says it was made in the Philippines. 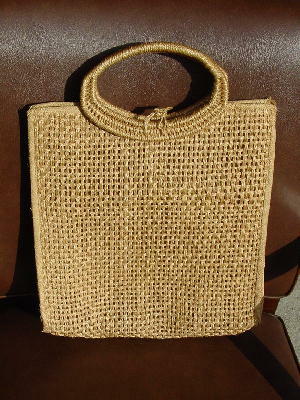 It has a roomy front flap pocket with a wooden loop closure. The top has a twine loop which goes around a wooden bead. 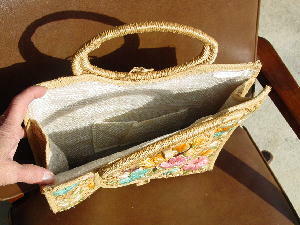 It has a plastic coated straw-like lining with one interior open pocket. 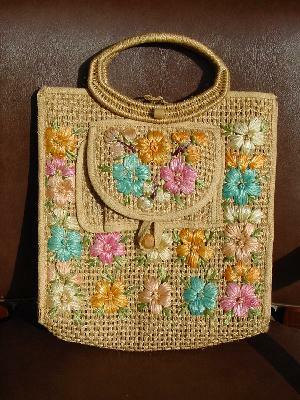 The front has raffia straw flowers in turquoise, dark apricot, light peach, vanilla, and dark baby pink. It was a present from her ex-mother-in-law, who had picked it up on a trip circa 1960. 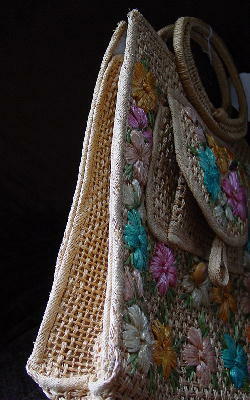 It's a fabulous vintage tote with wonderful detailing. The corners and parts of the side rims show some fraying. The model had it displayed in her apartment in Paris hanging by the handles from a long nail. It's for the true collector.